After the talk about couture shoes Nick Rayne of the Rayne family spoke to us. He was completely inspiring and SUCH a great speaker. I never previously understood quite how important Rayne are in terms of tracking the history of the shoe in the 20th century, but he really showed quite how innovative the company were in their day. The theatres inevitably led to the ballet and dance and hence dance shoes. This was where their first links came with the company they would later come to be. Adeline Genee was one of the first to promote the company. She was very famous in Europe and in 1897 came to England for what was meant to be six weeks and stayed for 10 years. Rayne provided all of her shoes and costumes when she first came over to the U.K. 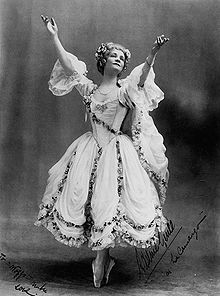 It is thought that a lot of the costumes for the Ballet Russes also came from Rayne. Although, this is simply speculation as the costumes tended not to be marked and the only evidence comes from company invoices. Diaghilev was very difficult to deal with and was notorious for doing runners to Paris when he did not want to pay! In the 1920’s Charles Rayne saw a gap in the market and realised that shoe design may be the next avenue for the company. The new store opened on 58 New Bond street. The logo that is now synonymous with Rayne was also designed around this time. They used a lot of American production techniques, this included using American soles to make the shoes more comfortable and flexible. The sizes and fittings were also based on American sizes. Rayne had designers based in America. Many of these people were first generation Italians so had instilled in them the ideas of Italian superior craftsmanship. The company then went from strength to strength gaining their first royal warrant in the 1930’s after Queen Mary had the brand recommend to her by one of her ladies in waiting. It is probably the designs of the 1950’s though which Rayne are best remembered for, elegant, expertly crafted and presented in their iconic yellow boxes. I have come across quite a few pairs of 50s Rayne shoes on my vintage travels and goodness me they tend to be good quality! It was during this period that Rayne had many iconic designers working with them including importantly Roger Vivier, who designed the shoes for both the Queens wedding and Coronation with the Rayne brand. One of the things that interested me most was their collaboration with Wedgewood in 1958. This was a series of shoes designed in a number of fabrics (satin and leather formed the bulk of the range) with real solid china heels. At the time there was an advertisement where they stood a London bus on top of the heels and they didn’t break! Nick said that to his knowledge none were ever retuned for chipping or breaking. The china was incredibly solid. The 1950’s also saw them move to a new store on Old Bond Street. The interior design was by the renowned theatre designer Oliver Messel. The store was decorated in the regency style with Japanese silk wallpaper. The sad ending is that whilst his was a beautiful building and one of the few examples of Messel’s work the Whole building was sledge hammered in 1987. The company who owned it had to destroy it over one weekend before it became a listed building on the Monday. It is so sad the lengths people will go to simply to gain better access to office space!